If you can’t wait until the fall to get your hands on OS X Yosemite, and you don’t want to cough up the $99 to get a Mac Developer Account just for the current Developer Preview access, Apple provides all users with a third option; joining the official OS X public beta program. 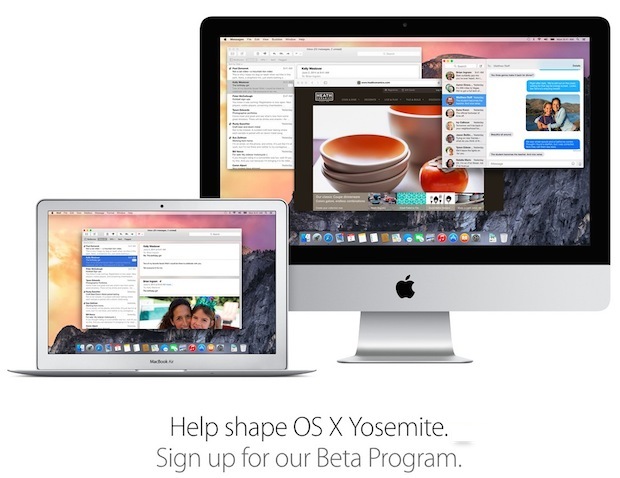 The OS X Yosemite beta program is limited to the first one million users who sign up, so if you have any interest in trying out the latest OS X version before everyone else and, perhaps more importantly, offering your own feedback of the beta release before things get finalized, now is the time to join. Requirements to be a beta tester are simple and straight forward, you’ll need a Yosemite compatible Mac with OS X Mavericks, to sign up with your Apple ID, agree to a simple EULA and confidentiality agreement, and then wait until the first Yosemite beta is released to the Beta Program in the near future. If you do sign up to beta test OS X 10.10, be sure you back up your Mac before installing the beta software. Apple specifically recommends installing the Yosemite beta on a secondary Mac, but another option is to install the beta version of OS X Yosemite on a separate partition to keep your primary OS X volume safely preserved from potential errors and bugs. It’s a good idea to review Apple’s Beta Program FAQ beforehand as well. The beta seed program was first announced earlier in the year, prior to the announcement of OS X Yosemite. i wonder if this beta seed program was introduced because so many users had/have problems with mavericks when it was released? Maybe, but unless the non-developer beta testers also receive sequential build updates, their reports will be limited to the earliest build, which won’t amount to much. I really hope the beta program allows them to receive updated builds along the way. That would really be something. I think it’s the problems with Mavericks combined with the massive backlash against iOS 7 and it’s many changes, Apple wants to have this tested in the hands of real users before unleashing a nightmarish user interface overhaul on a bunch of people. But with that said, Yosemite looks pretty good and very usable, as long as they change that horrible system font, tone down the folder icon color, and let users go to a full-blown “Dark Mode” to escape the kindergarten color scheming, this will be a great update to Mac OS X. The current DP1 build is very buggy though! There was a massive iOS 7 backlash? I must have missed that. I certainly hope Apple puts more care into Yosemite. Mavericks is a mess and comparable to the flop Microsoft had in Vista. From what I understand, all the new fitness stuff built into Yosemite is going to require all users to run an app on their phone, and get a minimum of 30 minutes exercise daily or the computer will shut off and not function until the exercise is done. No, you are wrong. Mavericks has a 51% adoption rate. At it’s peak, Vista was on about one in five PCs. I am using Mavericks, probably in a much more demanding way than you are, and it has been rock-solid. SInce 2004 I work with Mac. My opinion, the real performance improvement ended with Snow Leopard. On the same machine (MP Pro late 2011) Snow Leopard runs on the average 56% faster than Lion, ML runs slower than Lion and Mavericks slower than ML. Can you guys believe that Snow leopard 100% boots in 23s without any SSD drive? Not even mentioning, that files preview on finder is almost double as fast on 10.6.8 as to L and ML? So the reasonable question: why shall even bother myself to waste my time testing some Yosemite if, in the same time I can create something beautiful with beautifully running Snow Leopard? You’re right Jack, I fast noticed the boot time and shutdown time after upgrading to Lion. In 10.6.8 it was almost instantaneous, but in 10.7/10.8 and 10.9 it takes close to 2min. i have registered to the beta tester and downloaded Mavericks Beta AccessUtility app.backed up my mavericks and installed the utility app,it finishes the install and opened the mac App Store at the update tab but won’t give me the Yosemite download link.it says i don’t have any update. can u help me? I tried that but it wants me to pay 99$ and i want to beta test for free. I think i got to the first milion regitered. I understand that the download should be from the app store but the link doesnt work. Tried to ask in apple forum but no answer. The Apple Public Beta does not open until this summer with a more refined beta version that is further along in development, but you must sign up with Apple to be eligible for that. That’s why they say they will email you when it becomes possible to download Yosemite. Currently, the Developer Preview builds are only available to registered Apple Developers who pay the $99 fee. Patience will reward you in another month or two. Oh, and Yosemite will be free when it’s released this fall too. Maybe you can download Yosemite from a torrent?